Knit cotton gauze from Fabric.com. Nice and drapey. 1. My gathered sleeve width is about 2 inches shorter than instructed. 2. I wanted to make the longer blouse (there is a short version and a long version) but I had to settle for something in between. I actually like this length. I think this looks better with a belt than without. The knit fabric kind of weighs down and the top looks dumpy without it. The belt I'm wearing in these photos is close to what I want, but I'd like to find something just a bit more narrow. And softer. I found the wood buttons in my stash but I'm considering switching them out for ivory buttons, something more subtle. It'll depend on the belt that I settle on really. Cotton stretch twill in "putty", Robert Kaufman brand purchased at my local fabric store. 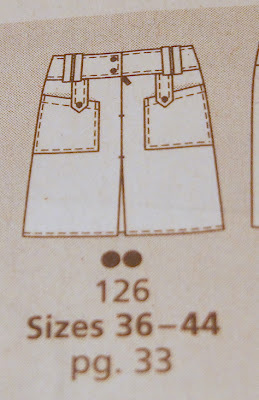 I was attacted ot this skirt because of the pocket and tab details. 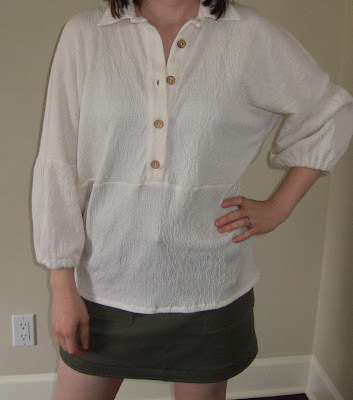 It's also supposed to have a kick pleat in the center front seam but I omitted that. This was my first time using topstitching thread; once I got the tension figured out I really liked it. The buttons are courtesy of Cidell who shared some of her Fabric Mart bulk buttons with me (thanks again Cidell!). I have a similar skirt that I've worn to death over the past few summers. I think this will be it's replacement and maybe I'll add another version to my closet later on. I'm completely in love with your skirt. It looks like something you might buy in a store. The top-stitching is amazing. Great job. Two really kewl new pieces for the collection! I can't wait to see this photographed all together! I love that skirt. What a nice non-khaki neutral for your wardrobe. Your topstitching looks great. Did you use any of the special feet to make it look so nice? I have the edgestitching foot and it really keeps my lines straight. There is another foot though, with the guide in the middle so you can stitch close to the edge. What to great pieces! I hope you enjoy them! Oh that outfit is fabulous! And I definitely agree, that shirt needs a belt. And I do like that belt you used! Two great pieces for your wardrobe. I agree with you on the top, the belt does make a difference. Great job. Work it!!! with that fab belt!! work it girl! Looks great! Very cute! I love that shirt with the belt! Dawn Yes, for some of the topstitching I did use a special foot, my SM dealer called it a "quarter inch foot" (perhaps it's the same as the edgestitching foot? ), it's got a piece that rests against the edge of the fabric so the needle sews exactly 1/4" in. I was excited to finally use this accessory! The top looks awesome with and w/o the belt. And your topstitching skills are incredible. I just bought one of those 1/4 inch foots but I haven't tried it yet. Good to know it produces nice results when used correctly. Both garments look outstandingly well on you! You are sewing like a storm! This SWAP will be completed in no time! What a great new outfit! I hadn't noticed that blouse before, now I have to go look it up! Looks great! I love the shirt with the belt! I wouldn't have noticed the pattern in the magazine but you really made it rock with the belt. I would steal this *entire* outfit. How much do I love it with the belt?? Your things look so professional. It's inspiring and intimidating at the same time..
Great outfit! I love that skirt. These both look really great, and so real life wearable! And I didn't even look twice at that top in the magazine. I think you chose the perfect fabric for it. Eek! That skirt is AD-OR-A-BLE! (Can you hear my emphasis on every syllable with that typing?) Again, I'm super impressed. I love the skirt too. How did you sew the tabs? 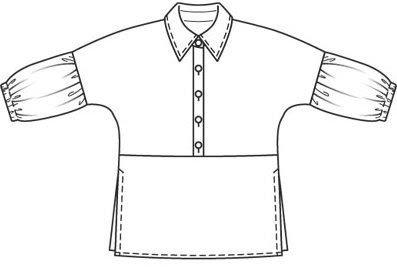 I'm trying to add epualets to a khaki shirt I'm making and I would love to know your techinque. Two perfect additions to your summer wardrobe. Hopefully some warm weather will come soon - we had a little dusting of snow over the weekend down here too - ugg! Great outfit! I love all those details on the skirt. Looks as if you can wear each piece to death! I've gotta look up the 1/4 inch foot, that stitching looks terrific! annaminiac - The tabs are very easy. For each tab you cut 2 pieces of fabric in the shape you want (plus seam allowances), sew them with right sides together, leaving an opening at one end, then flip so the right sides are out. 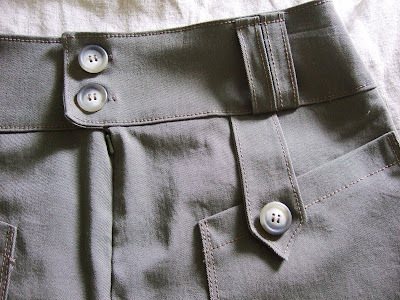 Now you can make the buttonhole. I am impressed by your ability to sew BWOF. Do you ever get confused since there are no pics? That skirt is amazing. Great job! It is a very cool ensemble, with a definite modern feel about it! Wow! i'm totally impressed! 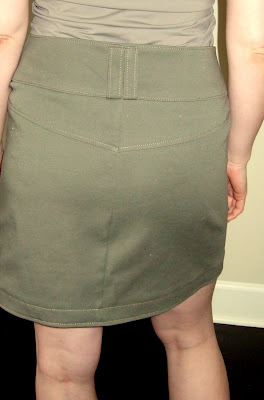 i love the top stitching detail on the skirt. great job! So adorable! I love your skirt, but I absolutely want to steal that shirt. And this means you are halfway done, right? Sweet! Love both the top and the skirt but especially the skirt. Am intrigued by this business of top-stitching thread. You'll have to tell me more about this tomorrow! Wow, I didn't look twice at that top in the magazine, but it looks so nice on you! And the skirt... great job, looks very professionally done and the most important is that it's beautiful on you! Can't wait to see the final wardrobe. Good luck! I like the blouse belted best. 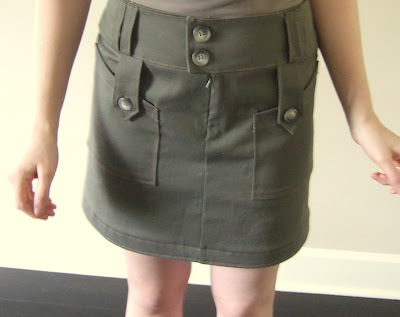 The skirt is really cute!It seams to me that the ivory buttons will work better with it. Your topstitching is soo neat! I want your whole outfit, belt included. I never would have looked at that blouse, but you found a real gem there the way you styled it. And the topstitching on your skirt?? *swoon*. Great job. 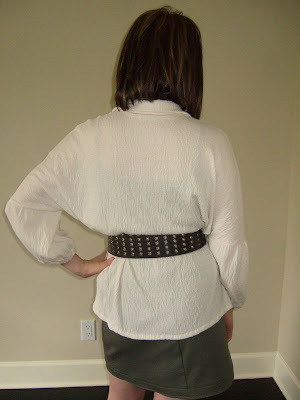 That outfit is super cute, I especially think the belted top looks great on you. I hope you occasionally take the time to really appreciate how great it is to be young and have clothes look fantastic on you, before you get old and it's no longer the case. Shirt and skirt are both super cute!! !